Now, inhale and slowly lower yourself downward. Your torso should remain upright and your elbows should stay close to your body. This helps to better focus on triceps involvement. Lower yourself until there is a 90 degree angle formed between the upper arm and forearm. Variations: If you are new at this exercise and do not have the strength to perform it, use a dip assist machine if available. These machines use weight to help you push your body weight. The purpose of the board press is to train specific ranges of the pressing motion in order to increase overall power for a bigger bench press. This is actually pretty simple. The lifter places a stack of boards on his chest. The bar is lowered until it touches the boards, and is pressed back up. The great thing about board presses is that both the positive and negative ranges of motion can be restricted and it is dependent upon the lifters preference. This can be done by simply choosing the height of the boards or how many boards to use. 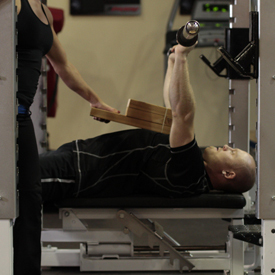 With a complete set of boards the lifter can choose which part of his range of motion to concentrate on or restrict. For example one 4 inch board works the range of motion from 4 inches off the chest up to lockout. Each additional board height decreases the range of motion. The more boards that are used the more the triceps are involved in the movement. The top half of the bench press really targets the triceps which is why you want to limit the range of motion when training simply to get bigger arms. 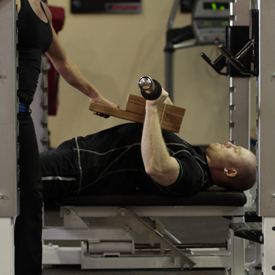 Start by setting a bar attachment (straight or e-z) on a high pulley machine. Facing the bar attachment, grab it with the palms facing up (supinated grip) at shoulder width. Lower the bar by using your lats until your arms are fully extended by your sides. Tip: Elbows should be in by your sides and your feet should be shoulder width apart from each other. This is the starting position. Slowly elevate the bar attachment up as you inhale so it is aligned with your chest. Only the forearms should move and the elbows/upper arms should be stationary by your side at all times. Then begin to lower the cable bar back down to the original staring position while exhaling and contracting the triceps hard. 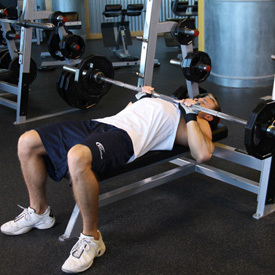 Begin by lying on the bench, getting your head beyond the bar if possible. One to five boards, made out of 2x6's, can be screwed together and held in place by a training partner, bands, or just tucked under your shirt. Tuck your feet underneath you and arch your back. Using the bar to help support your weight, lift your shoulder off the bench and retract them, squeezing the shoulder blades together. Use your feet to drive your traps into the bench. Maintain this tight body position throughout the movement. You can take a standard bench grip, or shoulder width to focus on the triceps. 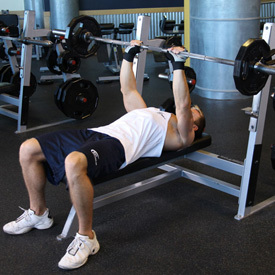 Pull the bar out of the rack without protracting your shoulders. The bar, wrist, and elbow should stay in line at all times. Focus on squeezing the bar and trying to pull it apart. Lower the bar to the boards, and then drive the bar up with as much force as possible. The elbows should be tucked in until lockout.